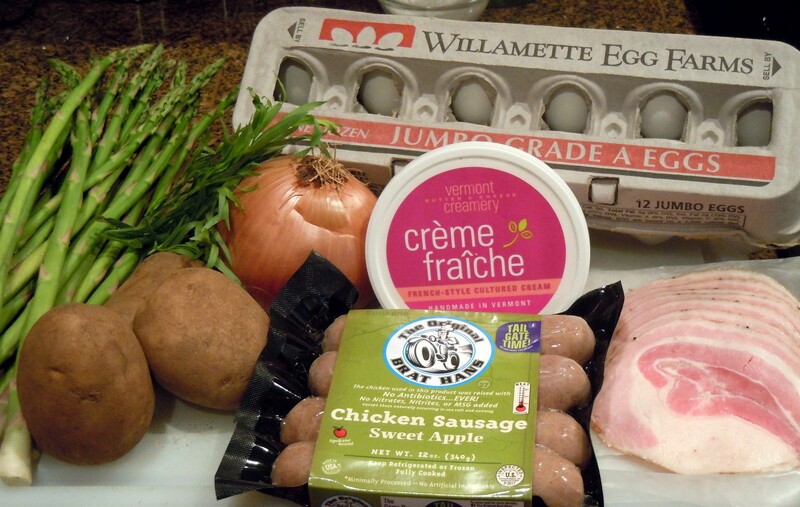 As with any hash adventure at Chez Clark, I simply must catalog the chicken sausage hash ingredients – fresh, wholesome ingredients – asparagus, tarragon, onion, Russet potatoes, Willamette Egg Farms eggs, Vermont Creamery crème fraîche, Brat Hans Sweet Apple Chicken Sausage and pancetta from the deli. (The ingredient list is at the end of this post.) Now let’s get busy! 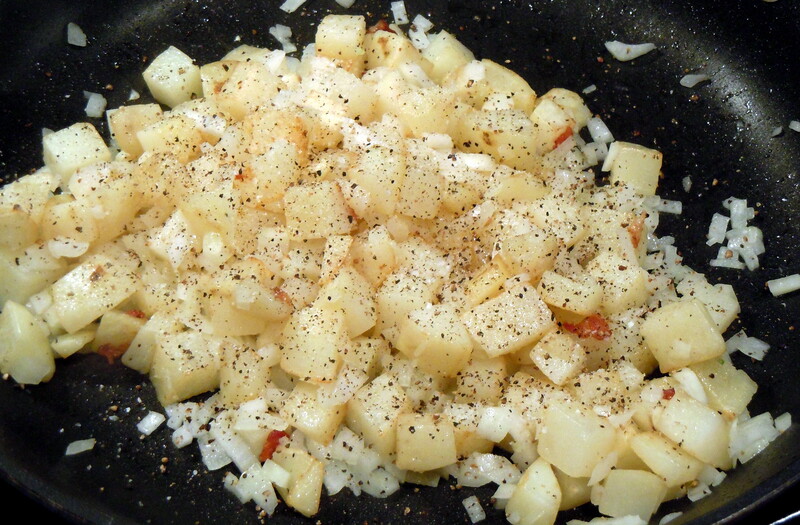 Simple ingredients make the best hash! Pre-heat the oven to 375°F. 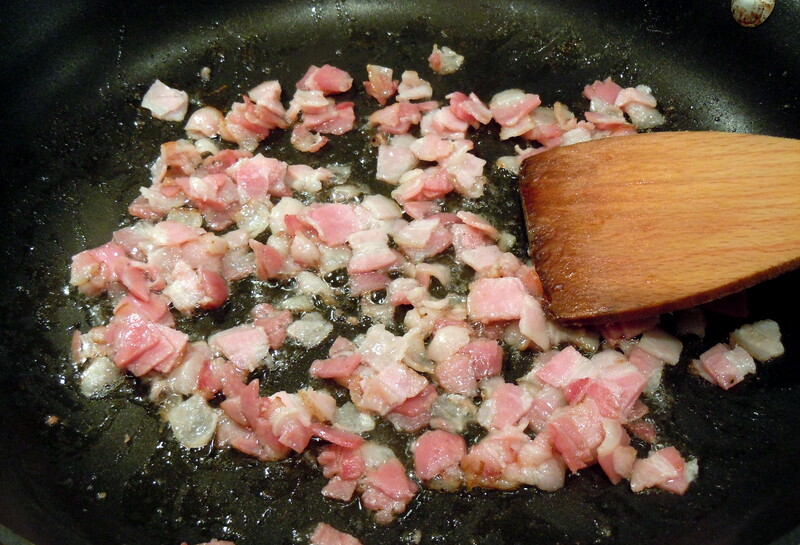 Chop up the pancetta and fry in a pan on medium until just crispy, remove with slotted spoon and place on a paper towel. Leave the rendered fat in the pan. Chopped pancetta cooking - molto italiano! Dice the potatoes into 1/2 inch cubes and sauté in the pancetta fat left in the pan for 15 minutes, then add the butter + diced onion and cook another 5 minutes until tender. Season liberally with kosher salt and fresh ground pepper. Potatoes and onion cooking in the rendered pancetta fat. 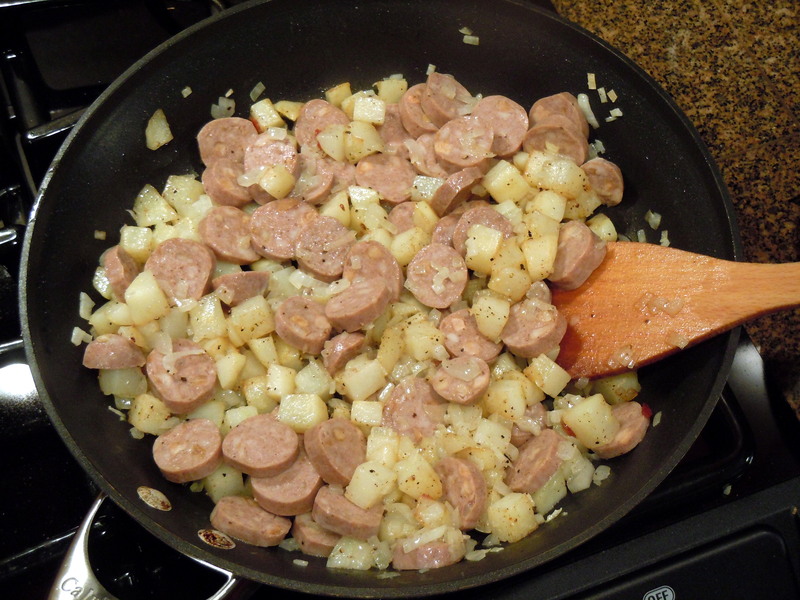 Slice the chicken sausage into 1/4 inch thick disks and add when potatoes and onion are tender and heat through. Adding the chicken sausage to the mix. 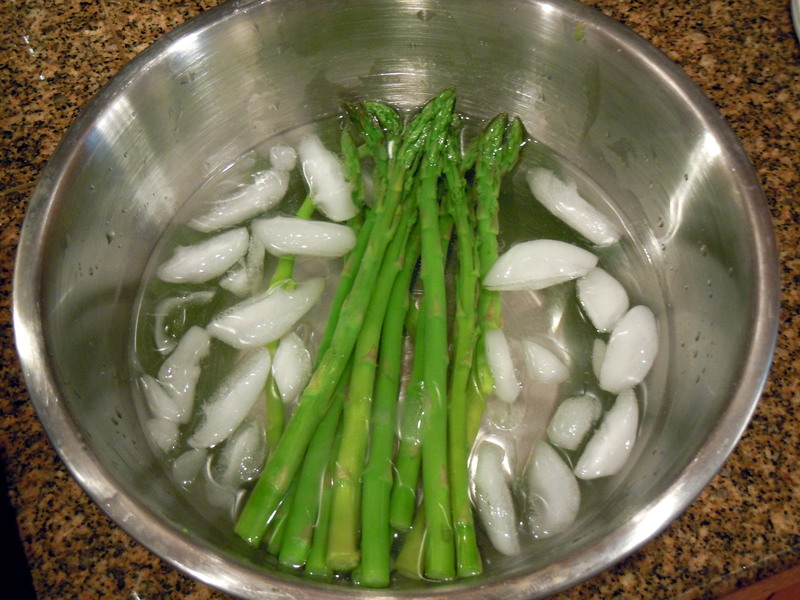 While the potatoes and onion are cooking, blanch the asparagus in another pan for 4 minutes, remove immediately, then immerse in an ice bath to keep the lovely green color intact. Ice bath for the blanched asparagus - nice and green! 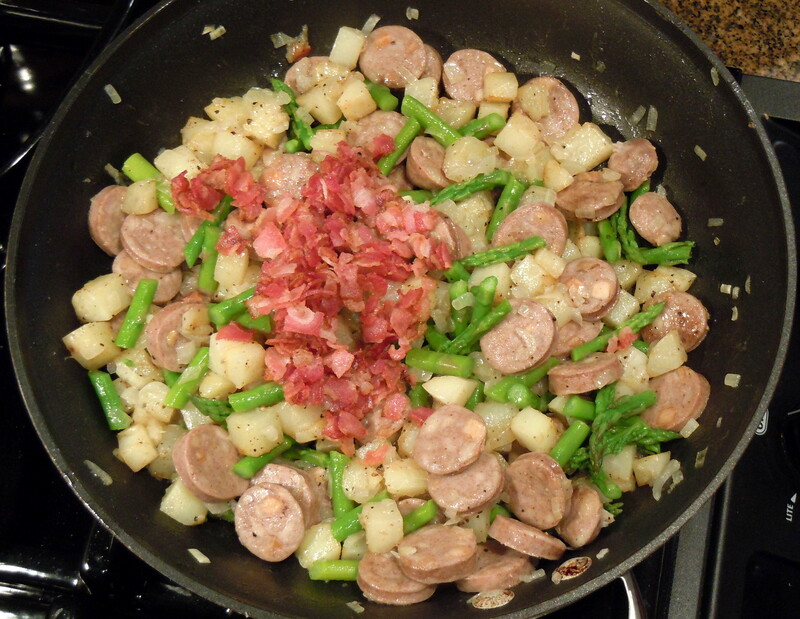 Cut the asparagus into 1 inch sections on a slant add to the potatoes, onion and sausage. Mix in the pancetta and adjust seasoning to taste. 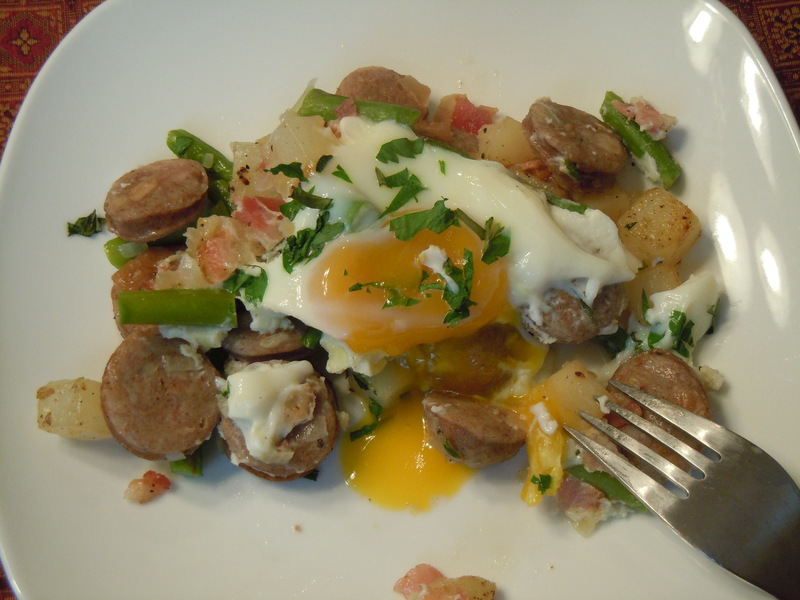 Optional: Add 1/3 cup of crème fraîche and stir in to make a creamy, moister chicken sausage hash. 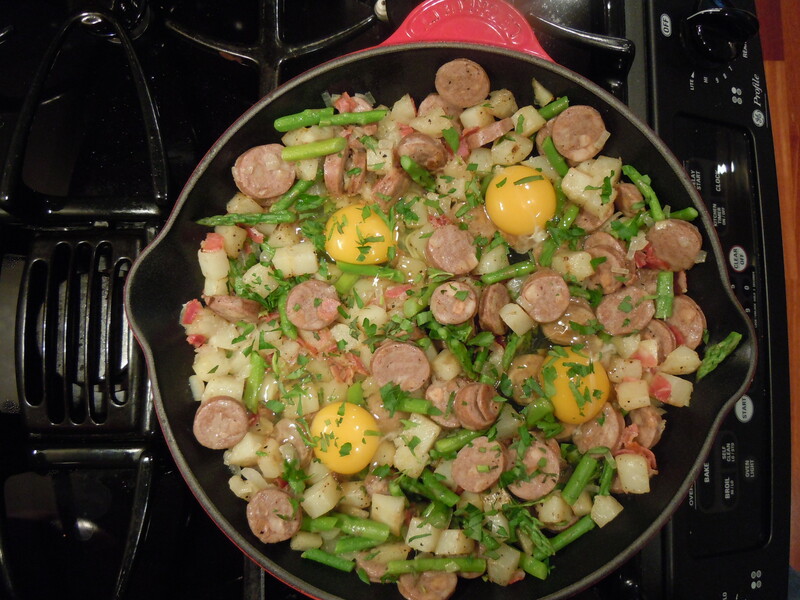 Adding the pancetta and asparagus - almost chicken sausage hash. 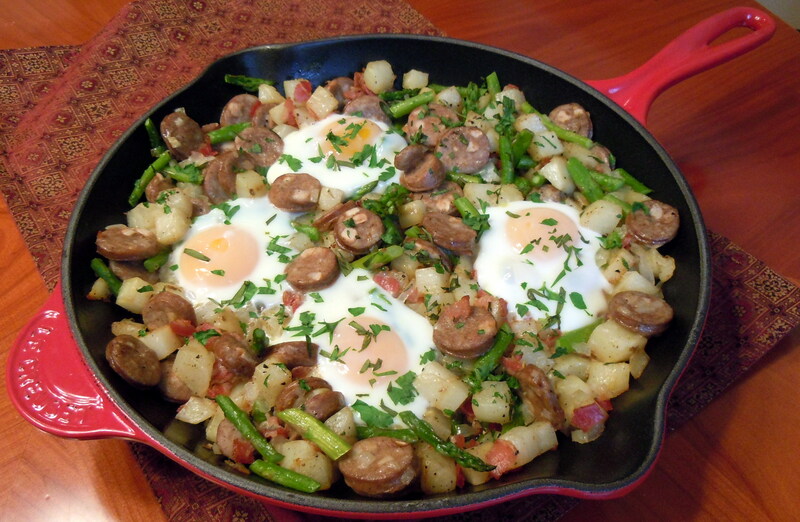 Transfer chicken sausage hash to an oven-proof pan. Create 4 “wells” in the hash. Crack each egg and place in a ramekin first, then slip gently into the well. Garnish with fresh, chopped tarragon and Italian parsley. Place in oven for 5 minutes or until eggs are set to your liking. Eggs nestled in the chicken sausage hash, ready to bake. A bird's-eye view of heaven on earth! 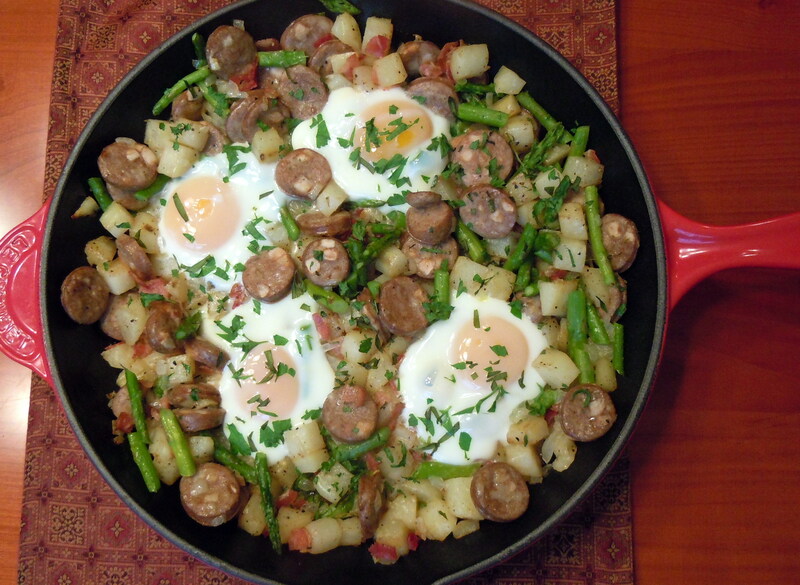 Voilà – time to chow down on some seriously tasty chicken sausage hash! Silky, creamy egg yolk and hash - sublime! You’ve done it again! Made me droooooool. You’ve also given me an idea. My brother-in-law made this great recipe with sausage, apples, onions and kale in a butter brown sugar sauce. I’m considering modifying it to make it a hash. The only thing I’m not quite sure of is the brown sugar part….but I guess I’ll never know unless I try. I’ll keep you posted if I make it! Finally got around to reading the instructions and I think I could actually make this. (Amazing considering my lack of kitchen prowess.) I had no idea you could bake an egg! I may even volunteer to make Christmas morning breakfast for the family (whoa).